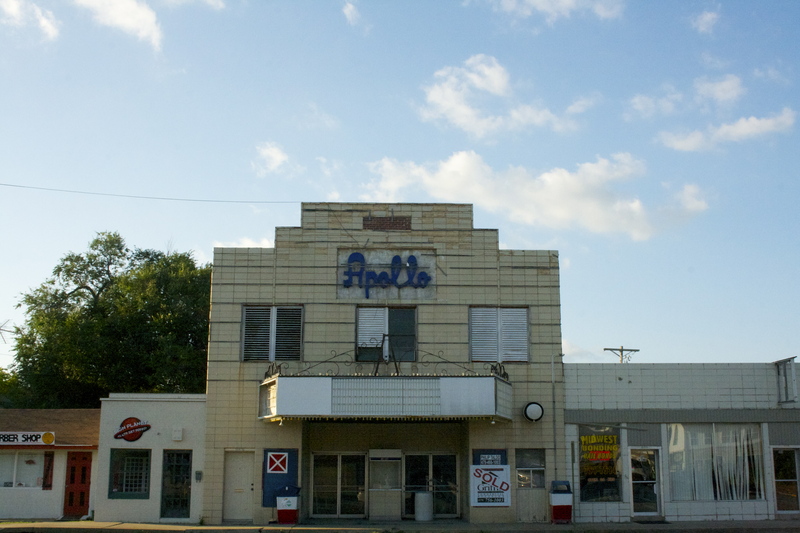 Condemned and completely remodeled and restored , the historic Apollo Theater on Emma Avenue in downtown Springdale sold on June 27, 2014 to Brian Moore and Tom Lundstrum. Moore and Lundstrum are both from Springdale and have collaborated to form Restore Springdale, LLC. The historic movie theater, now NWA most epic Wedding and Event Venue, reopened its doors August 2017. Tom & Brian have restored the theater with traditional ‘40s art deco flare and a contemporary update while protecting the historic nature of the building. In June 1948, William Sonneman announced that he would build a new yet-to-be named theater in Springdale. Work on the new theater began in March 1949. Soon after construction on the theater was underway, Sonneman’s manager of Springdale theaters, Max Cox, announced a contest to name the new movie house. I’ve heard variations of the story, but the gist of it is this: In 1948, Springdale antiques dealer Dallas Barrack had an impressive marble statue of Apollo for sale. One story says that Sonneman’s manager, Max Cox, saw the statue at Barrack’s and suggested Sonneman go take a look at it. Sonneman was so taken with the statue; he bought it for the lobby of his new theater, which he then named the Apollo. I have yet to find a photo of Apollo when he stood inside the theater. The Apollo opened September 29, 1949, with It’s A Great Feeling, a spoof about what goes on behind the scenes in Hollywood movie making. In November 1960, Springdale resident Dale Gilmore received a patent for “a continuous method of making popcorn balls” an invention he created for William Sonneman. Popcorn balls were a signature treat offered in the Sonneman-owned movie theaters, as was pickle juice served over crushed ice. The Apollo maintained its popularity throughout the 1960s. William Sonneman died in 1969 at the age of 92. By that time he was retired from the movie business. Once William Sonneman was gone, the Apollo was never the same. In 1971 ads start showing up for x-rated movies at the Apollo. These ads ran in the NWA Times and the Grapevine. The decision by the operators of the Apollo to run x-rated movies was met with opposition from a number of Springdale citizens who demanded family friendly movies return teo the Apollo. Sure enough, in mid-December, the Apollo showed Smoke In The Wind which was filmed in NW Arkansas, followed by a real About Face for the holiday season. But the x-rated movie problem didn’t go away. In January 1972, the City Council went on record opposing the showing of X-rated films in Springdale. It took over three years, but finally in July 1975, the Apollo was shut down and the owner and projectionist were charged with showing an obscene film, Touch Me. They pled guilty, were fined, and Judge Maupin Cummings ordered the Apollo to begin showing family movies or close down. After languishing for years, the Apollo was purchased in 1979 by Jim Ritchey. Mr. Ritchey resumed showing family friendly movies and did so for 14 years. The trend away from downtowns and the building of newer nicer theatres made it impossible to make money showing movies at the Apollo. Movies at the Apollo ended for good in 1993. The long era of movie theaters in downtown Springdale was over. The newly renovated Apollo re-opened it’s doors on August 17, 2017 by hosting a Grand Re-Opening with over 500 guests that attended. With over 5000 sq. ft. of event venue space, this venue is unlike any other in NW Arkansas. The front facade of the building is beautiful grey and white marble & the top part of the facade is limestone. As you walk into the foyer, the marble floors and 20 foot ceilings with the art deco crystal chandeliers are jaw dropping. Through the restored original oval glass and wood doors you make your way into the cocktail lounge. Here there is a marble top built in custom bar that is wrapped in cherry wood and there are the two staircases on both the east and west side in this room that lead you up to the Metropolis Room. The original 15 foot mirror, that dates back to the early 1800’s, now sits on the North wall in the lounge. As you enter through into the main ballroom, your eyes start to lead up to the gorgeous inverted 20 foot tall ceilings with 8 crystal chandeliers and champagne colored walls. There is state of the art A/V throughout the entire venue; including microphones, white chiavari chairs, tables, catering kitchen, ice machine, podium, all which are included in the pricing at The Apollo on Emma. Coming Spring 2018 there will be a outdoor garden patio located on the west side of the venue. This area will be covered year round from the sun & wind. There is electricity and lighting in this area which make a great space for an outdoor ceremony, shower, birthday, retirement, bachelor | bachelorette, graduation party, or even a great area for a corporate luncheon or company event.